Whoa, I came across a reference to this when reading an article about using one or two spaces after a period (the answer is one - read more here). The keyboard, pictured to the right, isn't new. 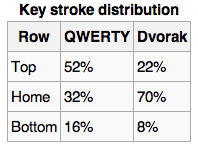 According to this Wikipedia article, it was developed in 1936, but the QWERTY (I actually had to look at the keyboard to type that) keyboard obviously won the popularity contest. What I found interesting is this chart: which shows that with the Dvorak keyboard your fingers stay on the home row 70% of the time, imagine the increase in your typing WPM! Interested in trying it out? The wiki article says this: "Although the Dvorak Simplified Keyboard (DSK) has failed to displace the QWERTY keyboard, it has become easier to access in the computer age, being compatible with all major operating systems (such as Microsoft Windows, Mac OS X, GNU/Linux. and BSD) in addition to the standard QWERTY layout. Most major operating systems have the option of toggling to the Dvorak layout. It is also supported at the hardware level by some high-end ergonomic keyboards." If anyone tries it out I'd love to hear about your experience.